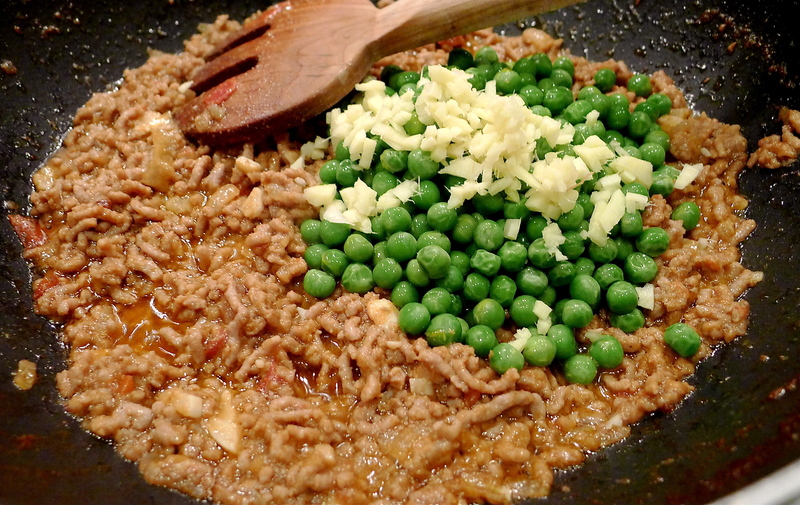 Mince and peas. A simple dish with very few ingredients. There are no big flavours here – just a warm buzz of spice and the sweet pop of peas in your mouth. Peasant food? Yes please. Watch the video here, then follow the recipe. Easy peasy. On a medium heat, brown your onions in the oil. This may take 10 minutes or more. Hold your nerve and get them a deep golden brown colour. Towards the end, add the garlic to soften but take care not to burn. Add 1 cup water, mince, tomato, chilli, salt, coriander and mix through. Bring to the boil then reduce the heat to medium and cook briskly, uncovered, until the water evaporates and the oil starts to separate out of the mince. Add the peas and the chopped ginger. Add 1/2 cup water. Cook off for another 5 minutes until you get the consistency you like. Some people like a bit of liquid, some like their mince to be drier. Scatter the fresh coriander, mix through for 2 minutes and serve. Absolutely Lovely, added left over mash at the end, wow, the taste is so authentic, with the homemade toutch,,, Only used 3oz of mince, altered the recipe to suit,, Try this, every1….